This week Summer student Shelby Hamp ends a six-week position as Artifact Photography Assistant at the Huron County Museum thanks to the Government of Ontario’s Summer Experience program. Shelby has been photographing museum artifacts in the Victorian Apartment gallery and main storage. In a guest post for our blog, Shelby shares some of her personal favourites among the artifacts she has taken pictures of. The Huron County Museum is filled with many weird and incredible things. I have come across little critters in jars, intricate designs on silverware and plates, and the miniature collection. My job at the museum is to photograph the toy collection, and this week I came across the miniatures. There is a ton of them; little Victorian furniture, coffins, washboards, and many other tiny versions of everyday things. Some were tiny product examples; others were children’s toys. These toys are in very good condition and are toys I wish I had grown up with. 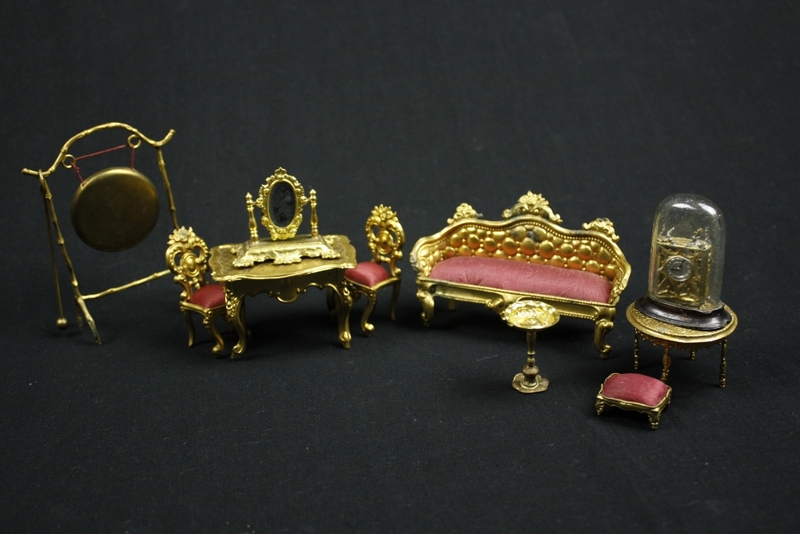 The neatest toys I have come across were small parlour items: a clock, couch, dinner gong, and a few other items. Everything is gold and the sofas and chairs have mauve fabric as cushioning. These toys were used between 1890 and 1910; the donor’s mother originally played with them and then the donor and her sister also played with them. Other doll items were also donated with this accession (gift to the museum) in 1995, and all have a history that dates to the late 1800s. The best part is: everything is still in mint condition. Visit the Huron County Museum at 110 North Street, Goderich to see more of our collection! Do you have a favourite artefact? Share with us on Instagram or Twitter.